MiraSorrento è una casa recentemente ristrutturata, gode di un panorama mozzafiato. Dotata di tutti i comfort wifi, microonde, macchina nescafe, aria condizionata, parcheggio etc. MiraSorrento si trova in località Priora, 15 min di auto dal centro di Sorrento, si consiglia auto medio-piccola. Tuttavia è possibile raggiungere il centro in 10/15min anche a piedi avendo l'accesso ad una stradina fatta di scalini. Thank you Francesca for a wonderful vacation! Your home is so very beautiful and you and your family are so very kind and hospitalbe! Attention has been paid to every detail. I can not wait to come back and explore the Amalfi coast and spend time in your lovely home! Thank you for making this one of the best travel experiences I have ever had!! The perfect home from home with the authentic Italian feeling. We stayed at Mirasorrento for just short of a week. Francesca (our host) met us upon arrival and showed us around, and gave us tips on where to go to see the most of Sorrento and surrounding areas. There was a wonderful look out from the home, the pictures don’t do justice. If you are looking for a relaxing quiet place to stay with the opportunity to also be central within 10-15 minutes walk then this is the place for you. A beautiful house, with a beautiful garden and a lovely host! Thank you Francesca and family. We had the pleasure of being the first guests in this wonderful holiday home. The whole family with two adults and three children had an amazing experience in Sorrento and surroundings. The accommodation gave us the best conditions for a mountain and city holiday. The experiences in the whole peninsula, Naples, Vesuvio and the islands will not end. We were fortunate to experience Sorrento at Easter where the Catholic rituals give the city a special and unforgettable atmosphere. 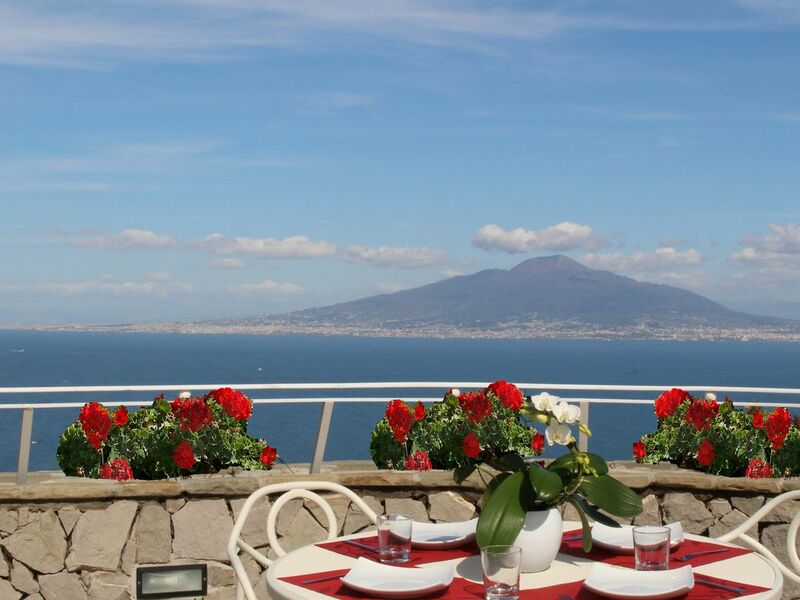 The holiday home is much better in reality than in the pictures and the outstanding views of Sorrento, the Gulf of Naples and Vesuvio will stay in our minds forever. Thank you very much for your great hospitality Francesca and greeting to your father. Thanks Morten, it's a pleasure to host you and your beautiful family. MiraSorrento is located in the borough of Priora, upon the hills of Sorrento, and it is 15 minutes drive from the city centre. Here you could relax in the garden. Could visit Sorrento, Capri, Pompei, Positano, Amalfi.